76 Years of Help and Support – LWML | "Northern Crossings"
The Lutheran Women’s Missionary League (LWML) is the official women’s auxiliary of The Lutheran Church—Missouri Synod. Since 1942, the LWML has affirmed each woman’s identity as a child of God and her relationship with Jesus Christ. Lutheran Women in Mission are encouraged and equipped to live out their lives in active mission ministries and to support missions around the world through their sacrificial gifts of Mite Box offerings and tireless service. As God’s children, we rest in the assurance that He loves us and sent His Son to redeem us. God is our rock and salvation. That firm foundation enables us to reach out into a changing world in need of the Gospel. 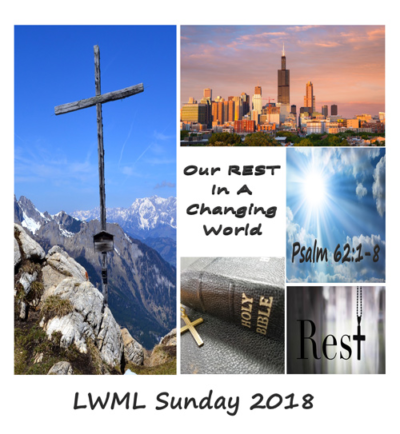 Today is LWML Sunday and the theme of the day is “Our Rest in a Changing World” – This is from Rev. Ken Hennings LWML Advisor. Many congregations in the Lutheran Church Missouri Synod are celebrating and thanking God for the ministry of the Lutheran Women’s Missionary League. For 76 years the LWML has been supporting mission work nationally and internationally. The women truly are Lutheran Women in Mission, and they are also women of encouragement. The LWML hasn’t just been collecting pennies, nickels, dimes, and quarters in their mite boxes; they have also been encouraging women and men in their faith walk to find true rest in God alone.